The journey to parenthood can be both a joyous and stressful time for many women. 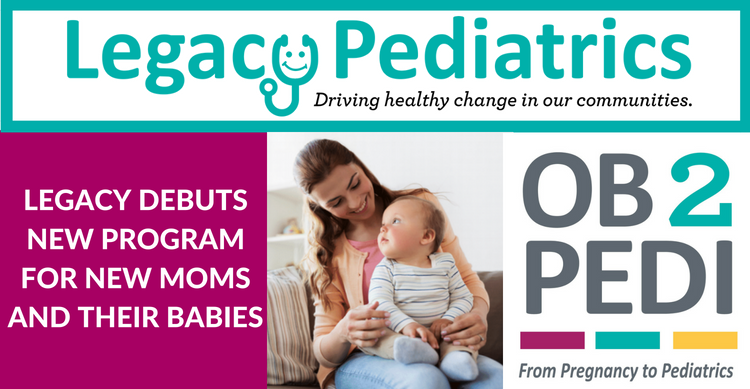 To help our patients on that journey, Legacy launched a new initiative focusing on that crucial period when a woman finds she is pregnant, through her pregnancy and delivery, and the baby’s first year of life. The program, called OB2Pedi, helps expectant moms through the many milestones that come with pregnancy. This is a very important period in their lives and one that may be filled with lots of questions. “Data shows that a healthy pregnancy with regular prenatal care ensures a healthier delivery and start to a baby’s life,” said Dr. Vian Nguyen, director of OB/GYN services at Legacy Community Health. The goal of the OB2Pedi program is to guide expectant moms through a healthy pregnancy and delivery into pediatric care for their babies. Legacy’s obstetric and pediatric teams work together to coordinate a seamless transition between the different phases of medical care. Through educational materials, the OB2Pedi program prepares expectant moms on what to expect during each week of their pregnancies. That includes how to handle common symptoms like fatigue and morning sickness, or more serious concerns like shortness of breath or high fever. After the baby arrives—congratulations. The program helps transition parents to the postpartum phase by offering classes on breastfeeding and car seat usage. Also available, Legacy’s behavioral health services for diagnosis and treatment of postpartum depression. Through the OB2Pedi program, Legacy’s obstetric and pediatric teams partner with patients throughout the journey. Check out the video featuring both Dr. Nguyen and Legacy’s Director of Pediatric Services, Dr. Tamisha Jones.